This fun design for birders is inspired by the British wartime morale-boosting "Keep Calm and Carry On" poster. 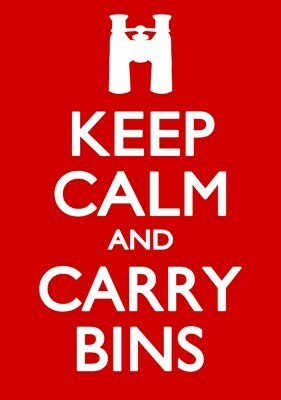 Here the text reads "Keep Calm and Carry Bins," something that birders should do at all times, anyway. If birders had their own Ministry of Information, surely this poster design would be one of the first orders of business. Meanwhile this original spoof design by Magnificent Frigatebird will work. To order by phone, call toll-free at 1-877-809-1659 from Monday - Saturday 9:00am - 9:00pm EST. You'll need to note the Product Number 030-1316746178 to make your order.